This flower originates in South and West Asia and was introduced by Korean Buddhist monks to Japan in the 6th and 7th century. Lately it is often grown for its oil. The most importand growing area is the Yamagata prefecture, where the "Safflower Festival" (benibana matsuri 山形紅花まつり) is held every year in July. It flowers in June and July, almost looking like a thistle (azami). Formerly, the red extract from the flower was used for cosmetics and dyeing. 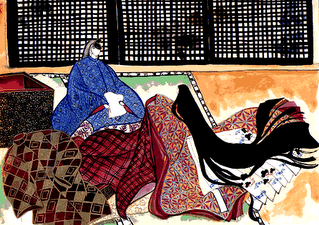 The name is already mentioned in the "Tales of Genji". is a highly branched, herbaceous, thistle-like annual, usually with many long sharp spines on the leaves. Plants are 30 to 150 cm tall with globular flower heads (capitula) and commonly, brilliant yellow, orange or red flowers which bloom in July. Each branch will usually have from one to five flower heads containing 15 to 20 seeds per head. 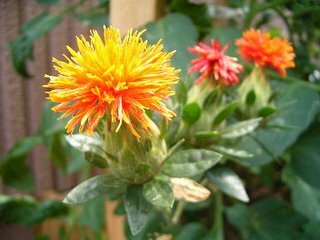 Safflower has a strong taproot which enables it to thrive in dry climates, but the plant is very susceptible to frost injury from stem elongation to maturity. Traditionally, the crop was grown for its flowers, used for colouring and flavouring foods and making red and yellow dyes, especially before cheaper aniline dyes became available, and in medicines. For the last fifty years or so, the plant has been cultivated mainly for the vegetable oil extracted from its seeds. There are two types of safflower that produce different kinds of oil: one high in monounsaturated fatty acid (oleic acid) and the other high in polyunsaturated fatty acid (linoleic acid). Currently the predominant oil market is for the former, which is lower in saturates and higher in monounsaturates than olive oil, for example. Look at more flowes here ! 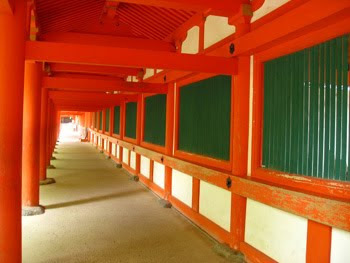 kooseiken 絳青縑（こうせいけん） "red and green robes"
Painting the body with red earth (akatsuchi 赤土 / 赭土) would protect the person from misfortune. kara kurenai からくれない 唐紅/ 韓紅 "crimson from China"
these two words are not often used in haiku. suou iro 蘇芳色（すおういろ）"sappan wood red"
The plant was introduced from China in the Heian period. and refers to the daytime sunshine. She is related to cinnabar (shu　朱) and then mercury.
. Why is Daruma always RED ?
. sekihan 赤飯(せきはん) "red rice"
This Benibana Museum was once the residence of Shirobe Horigome (堀米四郎兵衛) - a wealthy farmer around this area in Edo period. The total of the farm land was about 80 ares of the land and the residence had 6 warehouses and 7 wood-made warehouses. But, up to now, the most of the warehouses and the dwellings were withdrawn because of their advanced ages. But even now about five thousands of stuffs of the weapons and life necessities and old documents were preserved. In 1982 after the Town was donated these historic stuffs and properties, they restored and consolidated them in a good order. 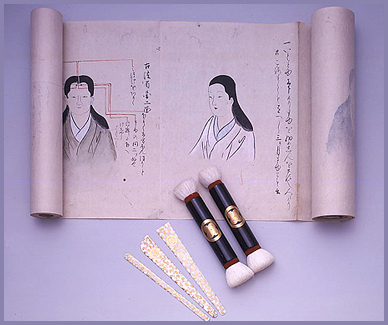 The Town opened them as "the Benibana Museum" in May, 1984.
. hake 刷毛 craftsmen's brush, brushes .